On Friday 6 September 1963 the Proms presented a concert to mark the 150th anniversary of Wagner’s birth. Apart from the Prelude and Liebestod from Tristan und Isolde, the programme came from Götterdämmerung and included ‘Dawn and Siegfried’s Rhine Journey’ and the entire third act. The conductor was Georg Solti with the Orchestra of the Royal Opera House, Covent Garden, of which he was musical director, and the concert was in effect a dress rehearsal for a new production of the complete Götterdämmerung which was to be staged at the Royal Opera House a few days later. Solti had become musical director of what was then called the Covent Garden Opera Company in September 1961, following a period of three years when the company had been without a musical director. Before that, Rafael Kubelík had held the post for three years and he had carried on the policy established after the end of the Second World War to perform operas in English with a resident company of mainly British singers. Solti’s arrival had heralded the start of a new era during which operas would be performed in their original language, overall standards would rise to reach the highest international levels and the Royal Opera would take its place among the greatest opera companies in the world. One of the most important milestones at the beginning of the Solti regime was to be a new production of Wagner’s Ring with the finest international soloists, backed up by the members of the resident company, which by then included a fine collection of experienced and talented singers. As it so happened, the Covent Garden Ring went along in parallel with part of the ground-breaking studio recording of the Ring that the Decca producer John Culshaw was making with Solti in Vienna. The highlight of the Wagner sesquicentenary celebrations at the 1963 Proms was this blistering account of Act 3 of Götterdämmerung by the Covent Garden Opera Company. 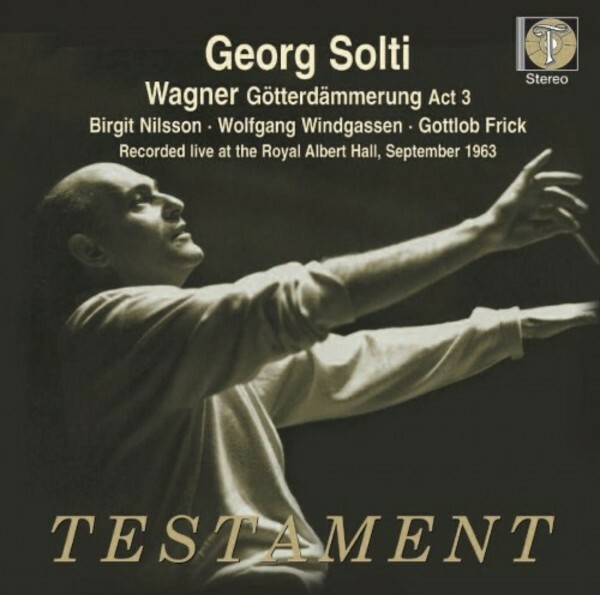 Incredibly, it was Georg Solti's first public performance of the complete third act (he had conducted parts of the Ring before, but never a complete one), and it served as preparation not only for the new Covent Garden production that opened a few days later, but also Solti's famous Vienna recording of 1964, the culmination of Decca's now legendary Ring cycle. The 1963 Proms audience was treated to the singing of three principals who went on to star in the Decca Götterdämmerung: and what singers they are! As the hero Siegfried, Wolfgang Windgassen is in fresher voice than he was for the subsequent studio recording. He was the reigning Heldentenor of the late 1950s and early 60s, and his many merits include the clear diction that makes his narrations so compelling. His opening scene here with the Rhinemaidens is particularly fine, while his death scene and the following funeral march are highlights of the disc, extraordinarily moving, with Solti moulding the pacing and dynamics for maximum expressive impact. Gottlob Frick was the blackest of Hagens, and surely the greatest exponent ever of the role (only Ludwig Weber from an earlier generation was his equal). You can feel his menacing presence in every bar, yet he never resorts to histrionics, an object lesson in how the part should be sung. Carrying all before her, it's Birgit Nilsson as Brünnhilde who provides this performance's crowning glory. Her gleaming soprano rides effortlessly over the orchestra in the Immolation scene with pinpoint accuracy and an unmatchably imperious feminine authority. The passage of time has only served to emphasise quite how extraordinary were her talents as a Wagnerian, and her mesmeric presence steers the drama inexorably to its conclusion. There's luxury casting in the minor roles too. Thomas Stewart and the great Marie Collier are outstanding as the Gibichung siblings Gunther and Gutrune, mere mortals vulnerable to Hagen's evil machinations but far from weak in voice, while the trio of Rhinemaidens includes a young Gwyneth Jones. The gentlemen of the Covent Garden chorus are thoroughly dependable in their supporting role, while the orchestra plays its socks off. Impeccably trained by Solti, it revels in the beauties as well as the splendour of Wagner's score (with some mightily fine horn playing along the way), amply demonstrating why under his direction it came to be regarded as one of the world's great opera orchestras. Solti's approach to the score will be well known to anyone who's heard the Decca cycle: gripping, incisive and urgent, with a wide dynamic range, but opening up to just the right degree for the music's purple passages. Without the sound effects and extraneous vocal ejaculations that characterise John Culshaw's Decca production, and with the added frisson of a live performance, here the music gets the chance to speak for itself, and it does so without fail. It's a staggering, overwhelming experience. Expertly remastered by Testament, the BBC stereo recording is amazingly vivid, belying the Royal Albert Hall's notoriously difficult acoustic. At the end, the audience erupts, as well they might: this is a real treasure, which should be snapped up by Wagnerians everywhere without delay.